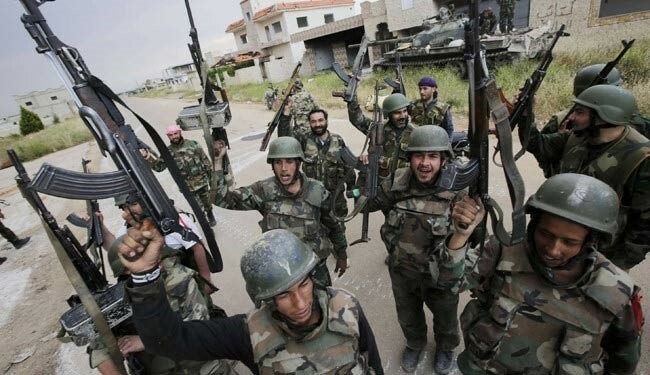 JNN 24 Mar 2015 Damascus : Units of the Syrian army and the armed forces on Monday launched wide-scale military operations against the Takfiri terrorist organizations across the country, killing scores of their members and destroying their arms and ammunition. Units of the army and armed forces killed 19 terrorists of ISIL and wounded others in al-Reshdiyeh neighborhood and Shbat Street in the city of Deir Ezzor in eastern Syria. This resulted in the death of 19 terrorists and the injury of 22. Ahmad al-Knadi, Tarek al-Alu, and Abboud al-Hussein were identified among the dead terrorists. Units of the army and armed forces killed two leaders of terrorist organizations linked to al-Nusra Front in the surrounding of Busra al-Sham city and destroyed a number of their dens in other areas in the southern Daraa province. Large numbers of terrorists were killed in the ongoing clashes between units of the army and terrorist organizations in the surrounding of Busra al-Shamcity in the eastern countryside of the province, a military source told SANA. Meanwhile, an army unit destroyed in a concentrated operation a missile launching pad in the area between Maaraba and Busra al-Sham city and another one and an armored vehicle equipped with a heavy machine gun in the western neighborhood of the city. Terrorists moving between Maaraba and Busra al-Sham were targeted and killed by the army units. Another army unit is hunting down fleeing terrorists in the area around the archaeological citadel in Busra al-Sham city, many terrorists had been killed in the area. The army also directed concentrated strikes on dens and gatherings of terrorists in al-Jiza, Jamreen, Smad and Kahil areas, killing and injuring a number of terrorists and destroying their arms and vehicles. An army unit carried out a special operation in al-Zirba town in Jabal Samaan area, 20 kilometers to the south of Aleppo city, killing a number of the terrorist organizations’ members and destroying their vehicles, arms and ammunition, according to a military source. The source told SANA that a number of terrorists’ vehicles were also destroyed and scores of them were killed in Handarat camp in the northern countryside of the province. Units of the army and armed forces killed a big number of Takfiri terrorist organizations’ members in the city of Bosra al-Sham in the countryside of Daraa province, a military source told SANA Monday. The killed terrorists included self claimed leaders of Takfiri terrorist organizations, the source added. Army units also destroyed a rocket launch pad in Wadi al-Zabdi in Daraa countryside and eliminated all the terrorists manning it. Army units eliminated a number of terrorists and destroyed their weapons and ammo in al-Mehasseh south of al-Qaryateen in Palmyra countryside, Homs province. Other units destroyed hideouts along with the terrorists, weapons, and equipment inside them in Wadi al-Dabaa valley which is near the Lebanese borders. Army operations in Homs’ eastern countryside left many terrorists dead or injured in Rajm al-Qasser, al-Sultaniye, Rahoum, Oum al-Reesh, and Masaada in Jub al-Jarrah area, in addition to killing and injuring many ISIL terrorists in the areas around al-Shaer fields. Another army unit thwarted an attack by a terrorist group affiliated with ISIL on a military point in al-Sukhna area 70 km east of Palmyra city, which resulted in the death of all members of the terrorist group, the destruction of two vehicles that contained explosives, and the confiscation of documents that were carried by the terrorists. Units of the army and the armed forces carried out concentrated military operations against dens of the Takfiri terrorist organizations in the northern al-Qalamoun mountains, killing and injuring scores of them in Talet Mousa and Talet al Rafi’a and near al-Fatla crossing in the mountains of Ras al-Ma’ara town. A number of terrorists were also killed and others injured and their weapons and ammunition were destroyed in the mountains of al-Mishirfa town, SANA reporter said Monday. In Eastern Ghouta area, a unit of the army and the armed forces targeted dens of al-Nusra and Ajnad al-Sham terrorist organizations to the east of Ain Tarma town, killing scores of their members. Terrorist Munir Wahid Zu’aitir of Lebanese nationality and terrorist Salim al-Salal of Palestinian nationality were identified among the killed terrorists. Libyan terrorist Said Qushaira was also killed and one of the terrorists’ vehicles was destroyed in a special operation carried out by the army in Douma city near al-Rahman mosque, the source added. In the northern side of Douma city, a unit of the army destroyed a terrorists’ den and all arms and ammunition inside it, in addition to destroying one of their vehicles and killing all terrorists onboard in Alyia farms. In Jobar neighborhood, sporadic clashes took place between an army unit and the terrorists at al-Kharrat street and the surrounding of Najim cemetery leaving many terrorists dead and others wounded. Meanwhile, the army carried out a direct blow against one of the terrorists’ dens in Erbin town, killing and injuring scores of terrorists, while a unit of the army clashed with a terrorist group in the farms of al-Qasimia village in al-Nashshabia area to the south of Eastern Ghouta. Units of the army and the armed forces killed scores of terrorists and destroyed their vehicles in al-Habit, Tal Dinit, Failoun, Kafar Jales, Deir Sunboul and Bailoun in the countryside of Idleb northern province. At least 12 people were martyred and 30 wounded on Monday when terrorist militants fired on government-held districts of Syria’s second city Aleppo. “Rocket shells fired by terrorists fell in al-Jamiliyeh neighborhood and Baroun Street, killing 12 civilians, most of them are children,” SANA news agency quoted a source at the Police Command of Aleppo as saying. “Thirty other civilians were reported injured, while public and private properties in the sites sustained damage,” the agency added. The bombardment was also reported by the Syrian Observatory for Human Rights, a Britain-based monitor, which put the death toll at 13. The group reported at least 33 people wounded and said the death toll was expected to rise because of the number of seriously wounded. The attack came a day after at least four people were killed in similar Terrorist fire. It also came as Human Rights Watch criticized opposition militants (both Takfiris and western-backed militants) in a new report for indiscriminate attacks against civilians in government-controlled areas. The Takfiri group, ISIL claimed responsibility on Saturday for a double bomb attack on Kurdish new year festivities which killed at least 45 people in the northeastern city of Hasakeh on Friday night. This entry was posted in Middle East and tagged al-Nusra Front, Armed Forces, Syrian Forces, Takfiri terrorist organizations, Takfiri Terrorists, terrorist organizations. Bookmark the permalink.